When scientists at McMurdo Station in Antarctica have time off from their field work, they often pay a visit to three nearby wooden huts built in the early 1900s by Antarctic explorers Ernest Shackleton and Robert Falcon Scott. That's what UC Santa Cruz biologists Daniel Costa and Luis Huckstadt were doing on a day off from studying Weddell seals when they realized that a pile of frozen pelts in one of the huts represented samples of Weddell seal tissue from more than 100 years ago, at the very start of human activities in Antarctica. By using sophisticated isotope analysis to compare samples from modern and century-old seals, the researchers were able to investigate an urgent question about human impacts on the Antarctic ecosystem: Is the targeting of Antarctic toothfish by a small fishing fleet operating in the Ross Sea changing the structure of the ecosystem and altering the diets of Weddell seals? "People have hypothesized that the toothfish are being depleted and that, as a consequence, the Weddell seal has shifted its diet to Antarctic silverfish," said Huckstadt, a postdoctoral researcher in Costa's lab at UC Santa Cruz. "We'd been talking about this issue and realized we had the samples right there to test it." Their findings, published August 30 in Proceedings of the Royal Society B, indicate that the seals' diets probably have not changed much over the past hundred years. But the results did reveal evidence of significant change in the phytoplankton community, the microscopic marine algae at the base of the entire food web in the Ross Sea. They attributed this change to a climatic shift that began with the end of a global cooling period known as the Little Ice Age, which lasted from about 1500 to 1900. With permission from the Antarctic Heritage Trust, Huckstadt and Costa, a professor of ecology and evolutionary biology, collected samples of fur from 34 pelts for comparison with samples from modern-day seals. To analyze them, they teamed up with two colleagues at UC Santa Cruz who are experts in isotope analysis, professor of ocean sciences Matthew McCarthy and professor of Earth and planetary sciences Paul Koch, both coauthors of the paper. "I first visited the historic huts in 1978 on my first trip to the Antarctic," Costa said. "I was amazed that the huts were left in the same condition as the day the explorers left 100 years ago. I saw seal pelts, penguin carcasses, and remains of sled dogs literally frozen in time. I always wondered if there was something we could do with this material. These relatively new isotope analyses provided us a way of using those frozen artifacts as a snapshot of the past." Stable isotopes of carbon and nitrogen are widely used as tracers of ecological processes. As top predators in the Antarctic ecosystem, Weddell seals incorporate into their tissues isotopic tracers that have passed up through the entire food chain, carrying evidence of the structure of the ecosystem and of the position or "trophic level" of the seals within the system. 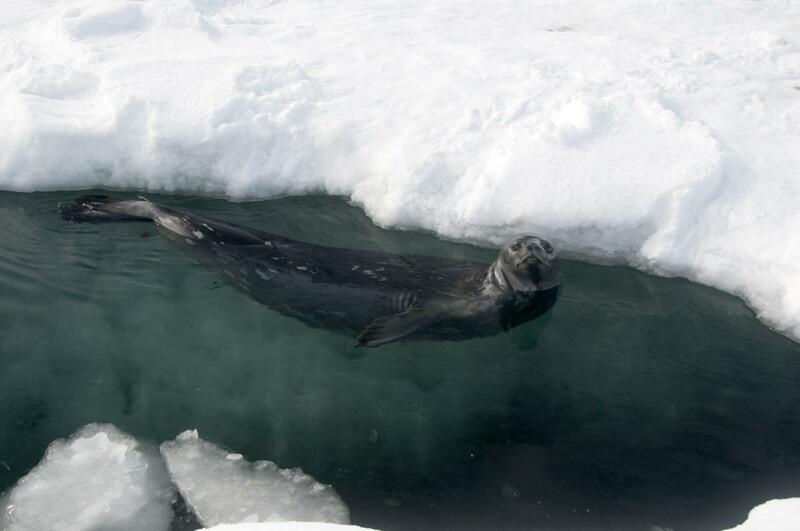 The researchers found that the historical "isotopic niche" of Weddell seals (as indicated by the variability of the carbon and nitrogen isotopes) was over five times larger than the modern niche. This could reflect a more highly specialized diet in modern Weddell seals, but this seems unlikely given the diversity of their prey today. Furthermore, an analysis of nitrogen isotopes in specific amino acids showed that the trophic level of Weddell seals is unchanged, suggesting they are still eating the same kinds of fish as they did historically. Currently, Antarctic toothfish appears to make up less than 10 percent of the diet of Weddell seals, and the findings suggest this was also the case 100 years ago. Changes in the sources of nitrogen and the composition of the phytoplankton community are more likely to account for the differences seen in the isotope data, Huckstadt said. "It looks more like a shift at the base of the food web, probably related to the transition from the Little Ice Age to current conditions, causing changes in the phytoplankton community," he said. Although human activities are beginning to have impacts on the Ross Sea ecosystem, it remains relatively undamaged. This makes protecting the area and regulating human activities especially important, Huckstadt said. In 2016, after lengthy international negotiations, the Ross Sea was designated as the world's largest marine protected area by the Commission for the Conservation of Antarctic Marine Living Resources. "It's not quite pristine, but it's about as pure an ecosystem as you're going to find on this planet," Huckstadt said. "Hopefully we can keep it that way." This research was funded by the Marine Conservation Institute and the National Science Foundation.